Danforth offers Plumbing Installation Services in New York State. Our services go far beyond faucets and toilets. 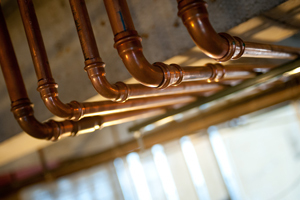 We offer plumbing system installations for water, gas, and sewage transport. Our Certified Professionals have years of experience designing and installing sustainable plumbing systems. Whether its new construction or renovation, Danforth has the experience and resources to tackle any project. Our Team has installed complex plumbing systems in Healthcare Facilities, Industrial Complexes, and Commercial Offices across the Northeast. Plumbing systems are critical to commercial building operation. They are an essential component of maintaining a sanitary and healthy building environment. Properly designed and installed systems allow for safe and efficient transport of fluids and gases including Potable Water, Sewage, Medical gases, Fuel Gas and many others. Danforth’s Plumbing Team has the experience to provide sustainable solutions for any project. Danforth is a single source for all your plumbing installation needs. We can evaluate, design, and install any system in any setting. Our Plumbers and Supervising Foremen are among the best in the industry with a proven track record in providing high quality plumbing system installations that are both practical and economical for our customers. Our Team specializes in maintaining occupancy and functionality to other areas of the project site while we work. We work around our customer’s schedule by providing 24/7 availability which allows our customers to sustain their productivity during installation. Start Your Plumbing Installation Project with Danforth. Meet with one of our Plumbing Installation consultants. We’ll outline our process and begin your project estimate. Need More information? Send us a quick message and we’ll reach out to you to help plan your next Plumbing Installation project. Get answers about our Plumbing Installation services and speak with a knowledgeable Plumbing Installation Expert.